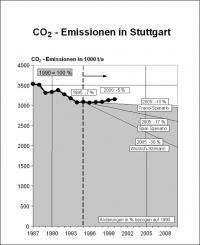 In 1994, Stuttgart's City Council decided on a CO2 reduction target of 30 % between 1990 and 2005. In 2003, this target was adapted to a more realistic reduction of 10 % between 2000 and 2010. According to an expert opinion, CO2 emissions in Stuttgart were reduced by about 5 % between 1990 and 2000 (see fig. 1). As for the traffic sector, the same expert opinion gave an increase of 1.8 % for CO2 emissions in Stuttgart between 1990 and 2000 and a reduction by 4.5 % between 2000 and 2005. 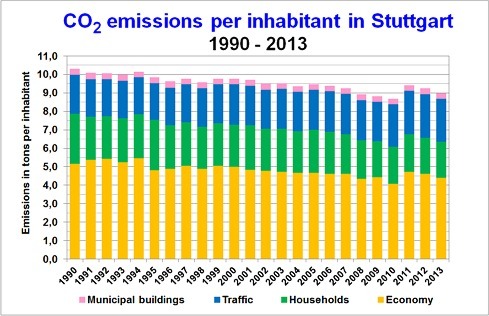 The State Statistical Office of Baden-Württemberg has also published figures about CO2 emissions in Stuttgart. Differences to the detailed expert opinion for Stuttgart can be explained by the merely rough determination of the data by the State Statistical Office and a partly different balancing system. The target of a 30 % reduction of CO2 between 1990 and 2005 decided by the City Council could not be achieved despite all efforts and the directly or indirectly funding of more than 50 million euros. The same is true for many other big cities. According to the information given by the State Statistical Office, the cities of Freiburg and Mannheim had even recorded an increase of their CO2 emissions by 25 and 17 % between 1990 and 2002. Emissions had dropped by about 6 % in Karlsruhe and by about 5 % in Heidelberg. Between 1990 and 2009, CO2 reductions in connection with city properties amounted to 60,000 tons or 27 %. After detailed balances had been drawn for the years 1990 and 1995 in the context of the development of Stuttgart's climate protection scheme, first interim results were reviewed in 2001. Balancing and therefore monitoring processes are now carried out with the web-based ecoregion system, which was developed and provided in connection with the Climate Alliance membership. This allows for the export of important balancing data in the context of Stuttgart's participation at the Covenant of Mayors (www.eumayors.eu/home_en.htm ) or at the Kommunaler Klimaschutz benchmark (www.benchmark-kommunaler-klimaschutz.net/ ). For the current balancing, the original balancing data were aligned with the annual data on the total final energy consumption and traffic by Stuttgart's Statistical Office. On the basis of a consistent balancing method, the data were used to draw a CO2 balance for the period from 1990 to 2013.